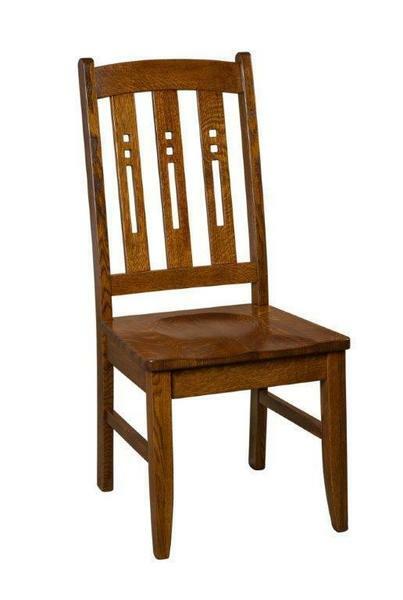 Our Amish Jamestown Dining Room Chairs are a work of art! Decorative back splats add an interesting design element that draws the eye in. 100% hardwood construction throughout ensures that you will be able to enjoy this heirloom-quality piece for many meals to come. Choose from a variety of American-sourced woods including hard maple, cherry, hickory, brown maple, and oak. Be sure to scroll down and take a look at all of the options we offer. Top it off with the finishing package that best suits your style. Every inch of the Jamestown Mission Chair can be customized to your taste. Going for a more simple look? The woodworker who makes your piece can skip adding the decorative cutouts. These pieces are made to order so it is truly up to you! Should you have any questions, we would be more than happy to help. Feel free to give us a call at 866-272-6773 to speak with an Amish furniture specialist.